Outstanding litter of Sprocker Spaniel Puppies. Gorgeous litter of 6 pups. 2 Boys chocolate with white bibs. 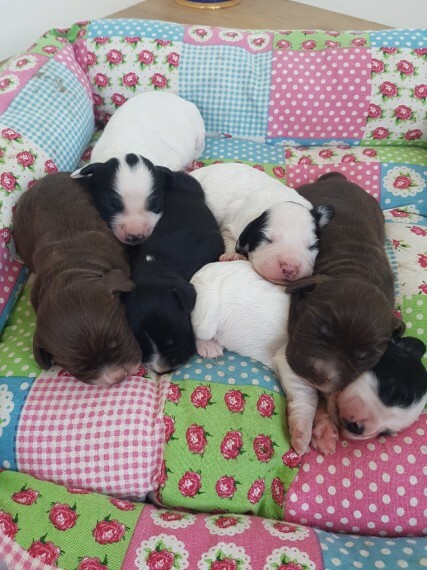 1 Boy black with white bib 2 Boys white with black markings 1 Girl white with black markings .sold. Mum is our gorgeous KC Registered black.white English Springer Spaniel. with 30 Field Trial Championships in her 5 generation pedigree. who is our family pet. The father is son of the 2015 Cocker Field Trial Championship Winner Mallowdale X Factor with 34 Field Trial Championships in his 5 generation pedigree. These puppies will be handled daily by ourselves and well socialized by children. All puppies will be microchipped at 7 weeks old. vet checked. wormed up to date. and first vaccination. Tails will not be docked. Will make fantastic family pets or working dogs. Please feel free to call. text or email with any questions or to view.reserve a puppy. Each puppy will leave with a blanket that will have mum..s smell on so will help puppy settle to there new loving homes. They will be ready to leave for new homes on on 24 May 2018 at 8 weeks old. 200 secures the pup of your choice.